Astro created his first graffiti art in 2000 in the northern suburb of Paris. Focusing on lettering and Wildstyle at first, this self-taught and passionate artist brings his knowledge and technique towards an abstract art which mixes curves, calligraphy and dynamic shapes. Inspired by artists such as Hartung, Vasarely and Mucha, Astro has created his own world by exploiting the subtlety of shadows and lights, the strength of colours, and the perspective of depths. 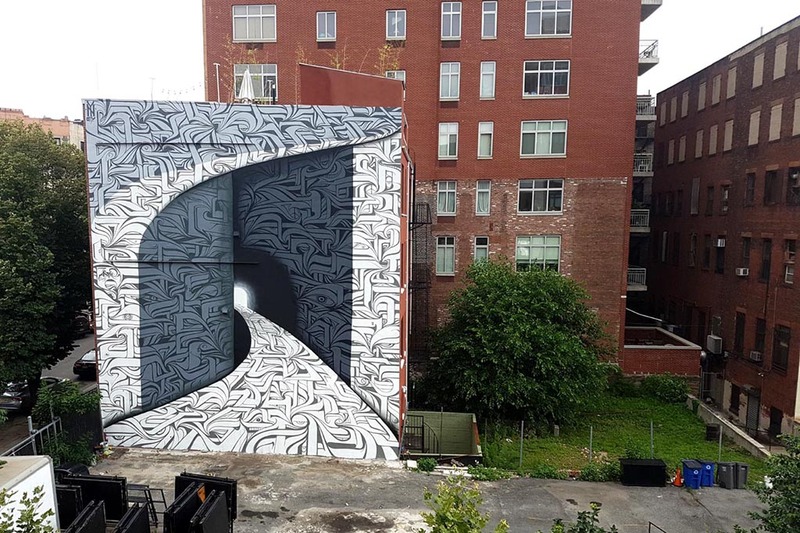 At ease with large formats, through walls on which he inscribed his art in the heart of the city, this muralist also likes working in a studio. Thanks to the spontaneous and impulsive imprint which characterizes him, Astro deceives the viewer’s eye by distorting the flatness of facades and paintings, creating impressive optical illusions. Astro is also the creator of a new technique called “CelloGraff” which he developed and uses since 2006 with the artist Kanos. His energy and his originality make Astro one of the major street artists, as shown by his presence at many international festivals (USA, London, Italy, Germany, Portugal…). Astro is now part of the CBS crew from Los Angeles.